So here is an interesting question for you. I was reading the results of a study conducted by the good folks from Trade Extensions that concerned how consumers view ethics and sustainability and how they affect purchasing decisions. When you ask people how important it is that companies behave ethically and with an eye towards sustainability, four out of five consumers regard it as important. That would suggest that doing the right thing (whatever that may be) is a critical factor in purchasing, right? 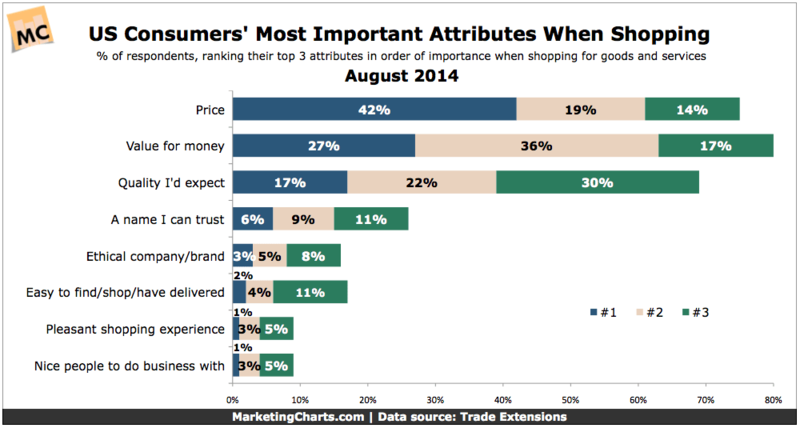 When asked to rank the three most important attributes when shopping, the most important factor is price – 40% of consumers ranked this number one. The second most important factor is value for money – 30% ranked this number one. And the third most important factor is quality – 16% ranked this number one. Choosing an ethical company or brand when shopping is the most important factor and ranked number one for 2% of UK and US consumers. Hmm. So is that a license for a company to do whatever they want as long as prices are low? Given some of the voices speaking out against Walmart, for example, over things such as foreign product sourcing, treatment of product suppliers, environmental practices, etc., apparently not. Like most things in business, it’s not quite that black and white. The research shows a desire from consumers to buy ethically but ultimately price, value and quality are the deciding factors. Other studies have shown similar results. One from Accenture found that sales and competitive pricing (61%) are by far the most critical factors in getting consumers to make a purchase. Superior products (36%) and customer experience (35%) are also key, according to respondents, followed closely by customer loyalty programs (31%) and relevant promotions (26%). Ad campaigns and celebrity endorsements trailed by a significant margin, presumably as they’re more influential in driving awareness than completed purchases. So back to ethical behavior. Can any company afford to ignore it? I suspect it’s very possible to do good while doing well and to enhance the quality of consumer’s lives in an honorable way. Maybe it’s not much of a selling point because so few companies have that focus? What is your take?